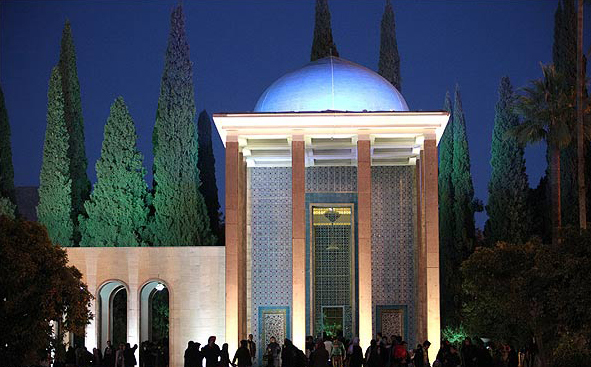 The Tomb of Saadi is a tomb and mausoleum dedicated to the Persian poet Saadi in the Iranian city of Shiraz. Saadi was buried at the end of his life at a khangah at the current location. In the 13th century a tomb built for Saadi by Shams al-Din Juvayni, the vizir of Abaqa khan. In the 17th century, this tomb was destroyed. During the reign of Karim Khan was built a mausoleum of two floors of brick and plaster, flanked by two rooms. The current building was built between 1950 and 1952 to a design by the architect Mohsen Foroughi and is inspired by the Chehel Sotoun with a fusion of old and new architectural elements. Around the tomb on the walls are seven verses of Saadi’s poems.